The blackberry plant is a fruit-producing bramble that grows well in the sandy Arizona soil. Blackberries grow on 2-year-old canes with each plant capable of producing 3 to 10 pounds of berries in the two-year cycle. Arizona grown blackberries begin to ripen in May and continue to produce through June. Well-maintained plants will stay viable for up to 15 years, with the best fruit producing years being eight through 12. Prepare a planting location that has a sandy soil, acidic pH and full sunlight. Test the soil pH to verify it is 4.5 to 7.5. Work ground rock sulfur into the soil to lower the pH number if needed. Plant the blackberry canes 2 to 3 feet apart in rows that are 8 to 10 feet apart. Dig a hole that is large enough so the roots can spread out. Gently cover the roots with soil and tamp to hold in place. Water the soil to a soaking depth of 3 to 4 inches after planting. Prune the canes to a length of 4 inches immediately after planting to stimulate new, strong cane growth. Provide water to the canes every day while they are establishing. Water established canes every two days at a rate of 1 to 2 inches per week during the blossom and fruit production season. Irrigate the soil more frequently if the soil dries to a depth of 2 to 3 inches below ground level before the next scheduled watering. Keep the soil moist during the blossom and fruit production season. Reduce water applications in September, irrigating only during periods of drought when the soil dries to a depth of 6 inches. Fertilize the blackberry canes with 5 lbs. of a balanced 10-10-10 fertilizer for every 100 feet of row and spread in a 2-foot area around the canes one month after planting. Apply 5 lbs. of fertilizer for every 100 feet or row again in June and July when the canes are blooming. Water the soil to a depth of 2 to 3 inches after applying fertilizer to assist with absorption. Place a 2- to 3-inch layer of organic mulch around the blackberry canes to limit weed growth and assist with moisture retention during hot Arizona summers. Pull weeds as they appear to prevent soil moisture and nutrient loss from weed competition. Prune to remove 2-year-old fruit producing canes after harvest. Do not remove young leafy vegetative canes. Prune older vegetative canes in June by cutting the top 2 to 3 inches off to stimulate lateral branch growth. 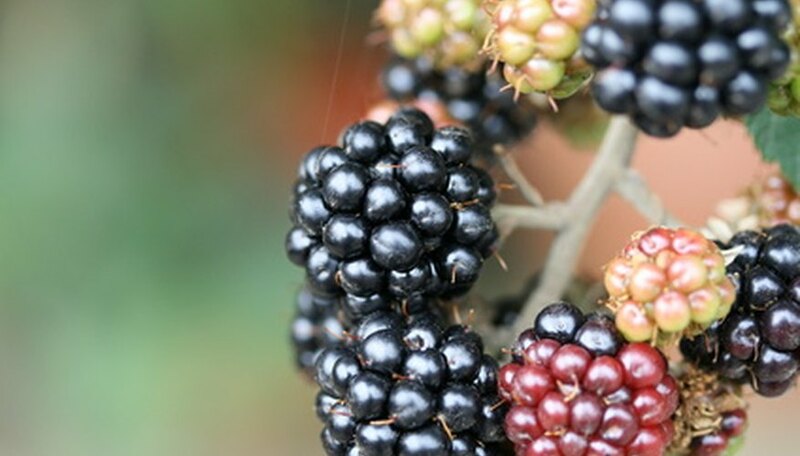 Remove all sucker growth that appears outside the blackberry rows. Place a mesh canopy or trellis sunshade over the blackberry canes in mid-summer to prevent sunscald during the hot Arizona summers. Blackberry cultivars that grow well in Arizona are Cherokee, Cheyenne, Choctaw, Shawnee and Womack.